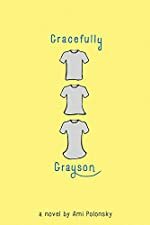 Review: Have you ever wondered if you were not actually you, well Grayson did? In Gracefully Grayson by Ami Polansky, Grayson thinks he is a girl because he draws princesses and draws with pink sparkly pens. Grayson had a fear if someone knew his little secret. Did Grayson revile his secret? You will have to find out in Gracefully Grayson. 12-year-old Grayson fights the challenge of being who he is. He always ate lunch in the library until Amelia came to his school. He started eating in the cafeteria when she came along. HE was still afraid of all the people in the room. Just all to hide his secret. Grayson was a boy that felt like a girl and acted like a girl. He needed self-confidence to believe in who he is. She hated track pants and loved dresses. She knew that she was a girl inside. At the end she did a great job in the school play and her family and friends understood her better. Gracefully Grayson is a wonderful book to teach kids about a sensitive issue and self-confidence. Grayson fights his own challenges but kids can relate to him. Kids can learn to believe in there selves. This is a very descriptive book that has very original characters. This book filled with real life plots that kids can relate from. This book shows that you don't have to be who people want you to be. You can be someone else. Grayson liked to draw girly things and that was when he learned that he was acting like a girl. That's why he never really ate lunch with everyone. He was too afraid to. This book shows how to make things better by fighting your challenges and he did that by trying out the school play and wanting to play the girl role. I would recommend this book for kids 10-13 because it is a novel and it has somewhat hard words. Also because it is about a boy that is a girl inside. One other theme is to believe in your self. Grayson wanted to believe in himself but was too afraid to, but not in the school play. This is a very good book and you should read it. We would like to thank Hyperion for providing a copy of Gracefully Grayson for this review. Have you read Gracefully Grayson? How would you rate it?